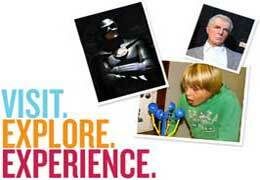 The National Wax Museum Plus is the perfect family destination this Easter mid-term break. The children can search far and wide for the chocolate eggs left by the Easter Bunny, and in the Time Vaults of Irish History, you can visit both the Easter Rising and Good Friday Agreement rooms, to commemorate two very important events in Ireland’s history at the time of their anniversaries. The Museum is not just about the fantastic wax works on display in the Hall of Irish Legends and the Grande Hall of Fame but is has much much more to offer. This offering comes in the form of amazing interactive experiences such as the one of a kind Wax Factor Studio, The Science Gallery and Discovery Zone, the fully functional Recording Studio, the magical children’s tunnels of wonder. For families and young Children the attraction offers the enchanted Children’s world complete with the magical tunnels, a Children’s cinema where classic family Easter movies are shown all day and all your favourite characters such as Harry Potter, Sponge Bob Square Pants and Batman are there to show you a good time. The Science and Discovery Gallery celebrating Irish heroes of science, engineering and invention will still focus on education but in an interactive and fun manner.. Who says there is no fun in learning? See Michael Jackson, Madonna, U2 and all the national and international superstars in the Hall of Fame , you never know Bono and the boys may have an Easter surprise just for you. Have your five minutes of fame in our Wax Factor studio which places you in the midst of a famous music videos and bring a copy home. As a cherry on top, make sure you make some molded wax copies of your children’s hands at our Wax Hands facility to remind you of the quality time you spent together. The National Wax Museum Plus promises to be a great way to spend an afternoon with you family friends or loved one this Easter, it will bring you back to your childhood as well as educating and informing on interesting facts you may not have previously known. Remember the Easter Bunny has been very busy hiding eggs all over the museum! It’s up to you to come and try to find the eggs, but quick! They’ll soon be all gone! The Easter festivities from Thursday 24th of March until Easter Sunday 27 Marck. This attraction offers a museum experience unlike any other, whether you are young or old, a culture vulture or fun seeker, male or female, star struck or star studded, The National Wax Museum PLUS is the ultimate entertainment experience for all. Due to popular demand they are delighted to announce that they have introduced a brand new Admission and Wax Hand Combo Deal. Staring from just €17 it’s the perfect way to visit the museum!